As 42-year-old Daniel Chavez sat down to tell his story, his daughter, Davida, crawled into his lap. The adorable brown-eyed, brown-haired 4-year-old wore a black Marvel shirt with superhero characters and a single ponytail. She smiled, posed and curiously scanned the faces in the room as her dad quietly began to speak. Since the age of 15, Daniel has been on his own. Even then, he said he always made sure his younger siblings were okay. Starting at an early age, Daniel worked hard provide for himself and others. He had a career as a pasteurizer for 12 years and spent another seven as a maintenance custodian for a church before being laid off. After that position ended, Daniel worked in the plumbing field and took other odd jobs to make ends meet. The situation left him discouraged because the jobs he did get still didn’t pay enough to take care of his family and secure housing. He and his former partner, Davida’s mom, lived with family and in shelters for a time. Ultimately, the couple separated and he took custody of Davida because he could provide a safer more stable situation. 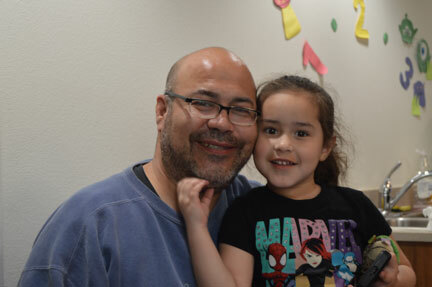 When Daniel learned about Marv’s Place and the opportunity for permanent supportive housing for formerly homeless families with children 5 years old or younger, he was thrilled. It would mean a real home for his daughter who he says just wanted to invite people over to see where she lived, something she couldn’t do before. Since living at Marv’s Place, Daniel has started barbering school and is currently participating in an internship program. He’s soaking up all the knowledge he can and is excited about his future profession. But like many single parents, Daniel is having difficulty securing childcare. His family is doing what they can to help, but when they aren’t able to, it means missing days from the program. Daniel has chosen to deal with things as they come. His daughter is happy and thriving, and that is most important to him. You can tell from talking to Daniel that Davida is his world. “My dream for my daughter is for her to be a positive, strong woman,” the single dad said. “I don’t want her to ever have her spirit broken. That affects people forever. I’m a product of it.” Daniel and the comfort of Marv’s Place has done a great job sheltering Davida from her family’s situation. She’s in preschool, has many friends she can now invite over and is not in the least bit timid. As Davida ran around the playground with the other kids, she didn’t hesitate reporting back to me–an adult she’d just met–that she felt the other kids were doing something wrong by picking flowers from a bush. After collecting one that had fallen to the ground, she announced proudly that she was saving it for her mom. At Marv’s Place, none of the drama matters. It is, in every sense, a safe haven—a place to heal and get the support the entire family needs to be successful and transform their lives.